Bite-Sized: City Quarter | Wake up, Meeples! 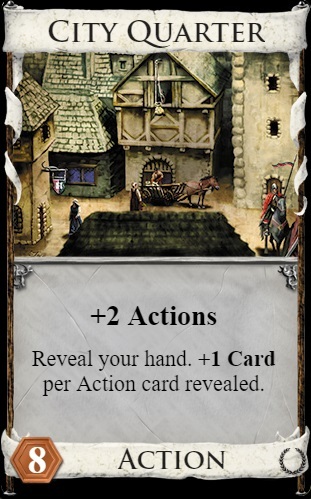 The effect of City Quarter has the potential to be extremely strong: +2 Actions, almost double your hand size. In the absence of discard attacks, you can play that card three times and you usually just draw your deck with lots of actions. Insane power. If you can build your deck so that you have almost exclusively Action cards in it, drawing your deck becomes very easy to do. In reality, it’s not always that easy. You can also draw zero cards with your City Quarter, which feels really bad for a card you paid 8 debt to have. To justify its cost, the first City Quarter you play should be drawing you at least two cards consistently, which means that over half of your deck needs to be Action cards, plus you’d like to have a chance to have a City Quarter in your starting hand. The most important thing you need to enable City Quarter is trashing. Trashing is important because it increases the percentage of Action cards in your deck, and it also increases the odds that you can find your City Quarters at the start of your turn. Most other cards can achieve this consistency by gaining a lot of copies of them and other Action cards, but this is more difficult with City Quarter because it is so expensive. For more details, check out this podcast episode.